Ideally suited to couples, young families, disabled travellers and people travelling with their pets, we don't accept “schoolies”, so you can enjoy a peaceful, quiet resort style holiday or break. Our 9 spacious and comfortable self-contained dog and pet friendly, wheelchair friendly cottages, are set in the seclusion of 16 hectares of remnant coastal rainforest, dry heath and ti tree wetlands, starting from an affordable $150 per night off peak. Avoid the crowds! Book a 5 night stay Sunday through to Thursday. If you need one night only give us call to check availability. The Rainforest Resort offers long term stays over the December and January period. If you are looking for two or more weeks accommodation give us a call on (02) 6685 6139. Native birds and animals abound in this oasis opposite the Byron Bay Golf Club, just 5 minutes drive (3 kilometres) south of the hustle and bustle of Byron Bay. Adjoining Cape Byron Marine Park and Arakwal National Park, Byron Bay Rainforest Resort is a peaceful retreat where you can escape to relax and revitalize. Stroll through the cool rainforest to the white sands of Tallow Beach and sparkling clear waters of the Pacific Ocean, just 300 metres as the crow flies and 15 minutes via walking tracks around Tallow Lake. 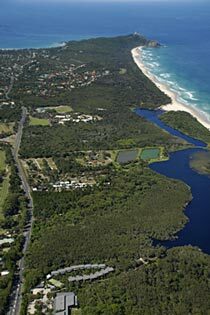 << Left: Photo slideshow showing aerial views north to Byron Bay, and south to Broken Head from rainforest resort. 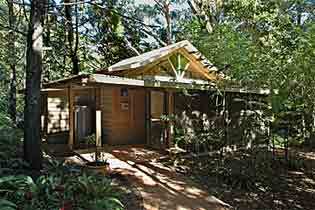 Byron Bay Rainforest Resort welcomes everyone seeking a quiet, peaceful getaway, including people with their four pawed babies, and disabled travellers, who are catered for with wheelchair friendly accommodation and facilities. We invite you to experience a holiday in Byron Bay where access is smooth and your special needs are catered for. Why not check availability or make an online booking now?